Seating at select performances of The Niceties is limited, but seats are released every day for sale. Please call Ticketing Services at 617 266 0800 to learn about our Advanced Wait List and be upgraded to a seat automatically when it becomes available. In this explosive story, a black student and a white professor – both brilliant, both liberal – meet to discuss a paper about slavery's role in the American Revolution. A polite conversation becomes a powder keg of race, history, and power, and neither woman will ever be the same. 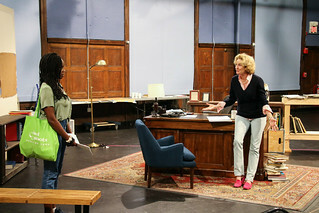 An entertaining and provocative nail-biter, written by Boston native Eleanor Burgess and directed by Broadway veteran Kimberly Senior (Disgraced), that everyone will be talking about. Approximate run time: The Niceties plays in approximately 1 hour and 45 minutes, including one 10-minute intermission. Playwright Eleanor Burgess invites you to come see her explosive new play, The Niceties. Go behind the scenes with the cast of The Niceties. This powder keg of a play about race, history & power starts August 31. See what audiences are saying about The Niceties. This powder keg of a play about race, history & power is on stage now thru Oct. 6. See what critics are saying about The Niceties. This powder keg of a play about race, history & power is on stage now thru Oct. 6. Join us in the rehearsal hall for the first day of Eleanor Burgess' hugely entertaining new play, The Niceties. Join us in rehearsal for Eleanor Burgess' powder keg of a play about race, history & power, The Niceties. Growing up in Brookline, playwright Eleanor Burgess started seeing plays at the Huntington almost 20 years ago. Before rehearsals, she spoke with Director of New Work Charles Haugland about how her life experience has informed her plays — and vice versa. Designer Cameron Anderson’s work will appear on the Wimberly stage twice this season, both with The Niceties and Melinda Lopez’s Yerma. Last month, Anderson spoke with Director of New Work Charles Haugland about her process and how she brings a play into three dimensions. In playwright Eleanor Burgess’ The Niceties, a student sits down with her professor during office hours; their lives are about to change. Through their intense conversation, Burgess brings intellectual might and refreshing nuance to discussing race, history, and power in America. IN ELEANOR BURGESS’ THE NICETIES, JANINE, A PROFESSOR OF GLOBAL REVOLUTIONS, MEETS TO DISCUSS A TERM PAPER WITH ZOE, A STUDENT WHO WANTS TO START A REVOLUTION HERE AND NOW. THROUGH THEIR CONVERSATION, BURGESS CREATES AN ELECTRIFYING DEBATE BETWEEN THE TWO WOMEN. 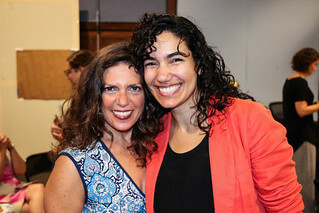 PRIOR TO WHEN REHEARSALS BEGAN, BURGESS AND THE NICETIES DIRECTOR KIMBERLY SENIOR SPOKE ABOUT WHAT IT’S LIKE TO BE IN THE AUDIENCE FOR THE PLAY AND WHAT CONVERSATIONS THEY HOPE IT SPARKS. Getting to know The Niceties' two leading ladies: Lisa Banes (Janine) and Jordan Boatman (Zoe). Eleanor Burgess is a Huntington Playwriting Fellow. She recently wrote The Niceties (2018) at the Huntington. Her work has been produced at Manhattan Theatre Club, McCarter Theatre Center, Alliance Theatre, Merrimack Repertory Theatre, Contemporary American Theatre Festival, Portland Stage Company, and Centenary Stage, and developed with The New Group, New York Theatre Workshop, Ensemble Studio Theatre, Page 73, The Civilians, Salt Lake Acting Company, the Lark Play Development Center, and the Kennedy Center/NNPN MFA Playwrights Workshop. She grew up in Brookline, Massachusetts, and studied history at Yale College and dramatic writing at New York University’s Tisch School of the Arts. Lisa Banes has appeared in The Niceties (2018) and Present Laughter (2007) at the Huntington. Jordan Boatman appeared in The Niceties (2018) at the Huntington and is a recent graduate of the University of North Carolina School of the Arts. Kara Harmon designed The Niceties (2018) and A Guide for the Homesick (2017) at the Huntington. D.M. Wood designed The Niceties (2018) at the Huntington. Elisheba Ittoop designed the original music for The Niceties (2018) at the Huntington. Her designs and original music have been heard at The Kennedy Center, Guthrie Theater, The Public Theater, New York Theatre Workshop, Steppenwolf Theatre, Signature Theatre, Oregon Shakespeare Festival, National Gallery of Art, Soho Rep, Denver Center for the Performing Arts, Two River Theater, Women’s Project Theater, Triad Stage, Woolly Mammoth Theatre Company, Arena Stage, Alliance Theatre, Cincinnati Playhouse in the Park, Cleveland Play House, LaMaMa, 59E59 Theaters, Children’s Theatre of Charlotte, Bonnaroo Music Festival, Okeechobee Music & Arts Festival, and the Center for Puppetry Arts. Sam Layco stage managed The Niceties (2018) at the Huntington. She previously worked on Tiger Style! (2016) and Topdog/Underdog (2017) as a production assistant for the Huntington.